It's important to use good quality ammunition if you plan on carrying a handgun for self-defense. These are our choices for the best 9mm self-defense ammo. Regardless of the cartridge you use, choosing the right kind of ammunition is just as important as choosing an appropriate self defense handgun. After all, your life could depend on it. The good news for everyone who uses a handgun chambered in 9mm Luger is that there are lots of great 9mm self defense ammo choices currently available on the market. However, the bad news is that it's really tough to pick a single load in particular and label it as the best 9mm self defense ammo. The last few decades have seen phenomenal advances in ammunition design, testing, and production. This has resulted in an abundance of good quality self defense ammunition in all the major calibers. While this is a good thing overall, the incredible number of choices available can make choosing a self defense load challenging and overwhelming at times. That being said, there are a couple different types of 9mm self defense ammo that consistently rise above the competition. So without further ado, here are, in alphabetical order, my picks for the best 9mm self defense ammo based on their performance under controlled conditions, their prevalence among major law enforcement agencies, and some subjective input based on my personal experiences with these loads under various conditions. The solid copper bullets produced by Barnes are some of the most effective 9mm rounds for hunting large, tough species of big game because they can be relied upon for deep penetration and consistent expansion with virtually 100% weight retention. These same characteristics are what make the Barnes TAC-XPD bullets such a great choice for 9mm self defense ammo. At 115gr, these bullets are on the light side for most 9mm self defense bullets. They're also loaded for slightly lower velocities than comparable 115gr 9mm loads, which makes for mild recoil. While that's great for shooters with compact and full sized handguns, this may not be the best 9mm self defense ammo for use in pocket pistols or sub-compact handguns with barrels shorter than 3.5". Even though it's not a bonded bullet, the Federal HST is still very well constructed and is just as durable as the best bonded (or solid in the case of Barnes) bullets currently in production. Developed over the course of many years specifically to meet FBI and other law enforcement specifications, it's no surprise that the HST is one of the most popular bullets used by law enforcement agencies in the United States. Federal started selling the HST to the general public a couple of years ago. They quickly gained a great reputation and are widely regarded as one of the best 9mm self defense choices currently available. The proof is in the pudding: regardless of whether you use a full size or short barreled 9mm handgun, if you want reliable deep penetration, good bullet expansion, and high weight retention, then it's really tough to go wrong with the 124gr Federal HST. 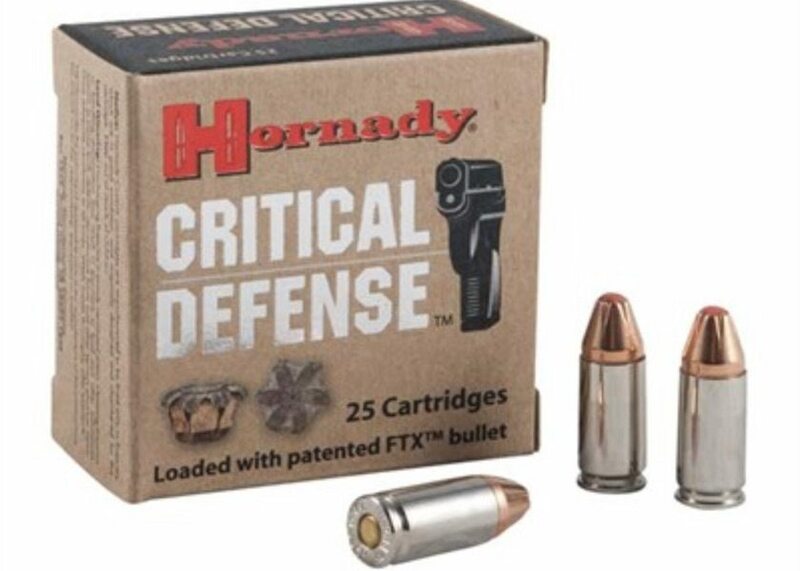 Unlike many of the other choices on this list of the best 9mm self defense ammo, Hornady designed their Critical Defense lineup of ammunition from the ground up for use in short barreled handguns during self defense situations. The bullet features a polymer tip that initiates expansion at low velocities and prevents debris (like clothing) from clogging the hollow point and adversely impacting expansion. This ensures reliable penetration and expansion at low velocities regardless of what barriers the bullet passes through first. Since Critical Defense ammunition is optimized for short barreled pistols, it also has very manageable recoil and is easier to shoot in very small handguns. Hornady also produces a "Lite" version of the Critical Defense for those who are extremely recoil shy, and a similar "Critical Duty" lineup of ammunition designed for those shooting full-sized handguns who need even better barrier-penetrating capability (like law enforcement officers). Speer jumped way out in front of the competitors in the 1990s when they introduced the Gold Dot lineup on ammunition. The Gold Dot was one of the very first (if not the first) bonded handgun bullets developed for law enforcement use and quickly became the gold standard of well designed handgun ammunition. Those bonded bullets are virtually immune to core-jacket separation and have earned an excellent reputation for high weight retention, deep penetration, and reliable expansion even after penetrating through a tough barrier. Not surprisingly, Gold Dots are one of the preferred types of ammunition for law enforcement agencies all over the world and are an excellent choice for 9mm self defense ammo. Even though the standard 124gr Gold Dot ammo is best in medium or long barreled handguns, Speer also produces a "Short Barrel" variant of the Gold Dot which is a great choice if you have a handgun with 3.5" or shorter barrel. The Winchester PDX1 Defender is another bonded bullet like the Speer Gold Dot. Similar to the Gold Dot, it also performs very well under a variety of demanding conditions. In fact, the FBI was so impressed with the overall performance of the bullet that the Bureau adopted the PDX1 Defender as its primary handgun ammunition. Featuring good penetration, weight retention, and expansion, the PDX1 Defender is another really good choice for 9mm self defense rounds, particularly for those carrying medium to large sized handguns. Pick a couple of the best 9mm ammo loads and shoot several hundred rounds of each in the handgun you plan on using for defense to test their accuracy and reliability in your particular handgun. Different firearms often prefer different loads and the only way to know for sure is to spend some serious time at the range and determine what your handgun shoots well. If the time ever comes that you need to use your handgun in self defense, you don't want that to be the first time you've shot your handgun with the self defense ammunition you're carrying. Additionally, make sure that whatever self defense load you choose is legal where you live. Certain states and local jurisdictions (like New Jersey and San Francisco) have onerous laws regarding the use of hollow point or "Law Enforcement Only" types of ammunition, and you don't want to inadvertently run afoul of your local gun laws if at all possible. Finally, invest the time, money, and energy into becoming proficient with your chosen self defense gun. A great handgun shooting the absolute best quality ammunition is useless if you cannot hit your target when it counts.